For $10, you can buy four ounces of War Water, which, the description states, has been used for centuries for protection, and when placing and removing curses. While it was created and aged for thirty days using rain from a violent thunderstorm, along with roots and coffin nails, those are not all required elements. And, considering how easy it is to make, it’s something everyone can do. Full moon rain might be nice, but water from any natural body of water or even from the tap can be used. Also consider melted snow. 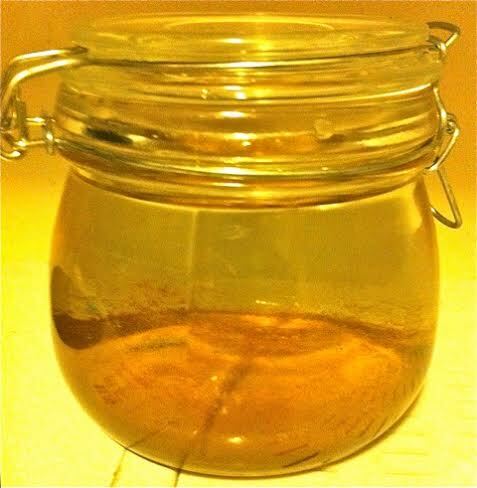 A friend makes his (see photo) by putting iron nails (3, 9 or 27) into a glass jar of water on the night of the full moon and letting it sit until the night of the new moon when he removes the nails that can then be used again. I know a witch who uses one railroad spike. Other recipes can be found that call for beginning on a Tuesday and leaving the nails in the jar for at least 15 days, preferably in the refrigerator to prevent bacteria from growing, and with the lid removed periodically to speed up the oxidation process. The water is ready to use when it has a rusty tinge to it. It’s also known as Water of Mars, and the god of war can be asked to bless the water with his powers. Use War Water for psychic protection, to banish evil and remove negativity, to protect from magical attacks and to remove roadblocks. Another helpful recipe for dispelling negative energy, and cleanse tools and spaces is known as Four Thieves Vinegar. Legend has it that during the Middle Ages, four thieves, one of them an herbalist, robbed the homes of those who had died of the plague, yet never caught the disease. Since the concoction was said to be made of ingredients having antibacterial, antiviral, antiseptic and antifungal properties – vinegar infused with wormwood, rue, mint, sage, lavender and rosemary – it could very well be a true tale. Today it’s still used as a remedy against many illnesses, to increase personal power, to charge spellwork, and as well as a disinfectant and a bug spray. The recipe I was given calls for mixing garlic, rosemary, rue and lavender flowers in apple cider vinegar for 10 days, shaking daily. The one in the cruet was made with rosemary, rue, sage, garlic, lavender and vinegar. Yet another is made by steeping rue, black peppercorns, cayenne pepper and garlic in apple cider vinegar. Herbs should fill about one quarter of the bottle or jar. It’s always nice to bless and consecrate each ingredient, thanking it for its magical powers. Also consider charging the final product with your intentions. Most recipes say to seal and let the herbs steep in a cool place out of direct sunlight for four to six weeks, shaking every day, then pouring through a coffee filter. The vinegar can be sprinkled in rooms and on tools. It can also be consumed as a tonic – a shot glass full at a time.